Hanoi’s airport authorities have outlined a plan to add two new terminals at Noi Bai International Airport to deal with a boom in passenger traffic that is outpacing earlier forecasts. 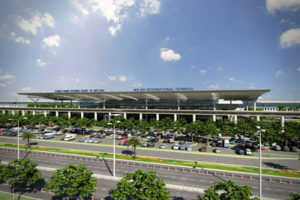 Local media reported the city plans to build terminals, T3 and T4, to ease pressure on the existing T1 and T2 terminals. The move will ensure the airport can handle 50 to 75 million passengers a year, but it will require private investment. Hanoi Party chief, Hoang Trung Hai, was quoted saying Noi Bai is not as busy as Ho Chi Minh City’s Tan Son Nhat International Airport, but it will soon reach its capacity ceiling as forecasts suggest there will be a 30% to 40% increase in demand in the years to come. Designed for 25 million passengers a year, Noi Bai welcomed 20 million in 2016, up 20.5% against 2015. Passengers in 2015 grew 21%, the report said. Passenger traffic will exceed the 25 million a year ceiling in three years and then double within 20 years, it added. Hanoi’s tourism sector, this year, will generate 23.39 million trips, including 4.08 million foreign visits, with an estimated revenue of USD2.89 billion, according to the Municipal Tourism Department. It reported that the capital welcomed 21.8 million visitors in 2016, including 4 million foreigners, earning USD2.72 billion, up 13% year on year.